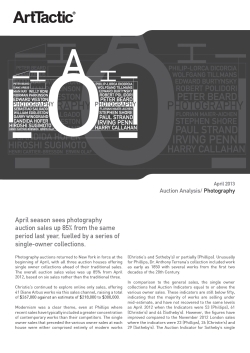 April season sees photography auction sales up 85% from the same period last year, fuelled by a series of single-owner collections. Photography auctions returned to New York in force at the beginning of April, with all three auction houses offering single owner collections ahead of their traditional sales. The overall auction sales value was up 85% from April 2012, based on six sales rather than the traditional three. Modernism was a clear theme, even at Phillips where recent sales have typically included a greater concentration of contemporary works than their competitors. The single owner sales that preceded the various owner sales at each house were either comprised entirely of modern works (Christie’s and Sotheby’s) or partially (Phillips). The report includes historic performance analysis of the auction market for Modern and Contemporary Photography since 2006.